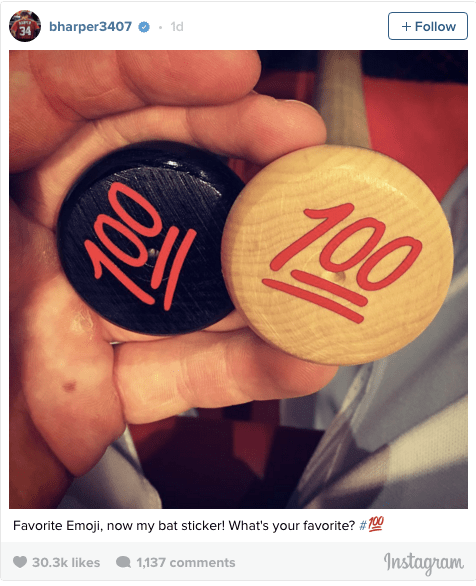 You knew after having this decal on his bat knob (how awesome is Bryce Harper for using an emoji on a damn bat), that he wouldn’t be stuck on 99 career home runs for long. He was simply waiting on one of his old rivals; Julio Teheran, to bring out the very best in him. It was Harper’s fifth career home run off Julio Teheran. He has now hit five off Teheran and five off Tom Koehler, the most against any pitcher in baseball. And it seems like just yesterday that we started doing these posts when Harper launched his first one back in 2012 against the San Diego Padres at Nats Park. MLB.com was nice enough to put a video together of every one of Bryce Harper’s home runs. The Nationals won this game 7-2 behind seven-plus strong innings from Stephen Strasburg. With many players, it’s hard to say if they’ll hit hundreds more. With Harper, you know we’re going to be doing about 400 more of these posts, which is astounding.